Also, if you missed my EtsyUp Conference recap on the podcast and all the notes which I took during the conference and posted on the blog, now’s a great time to catch up. This doesn’t happen all that often but starting next week, CreativeLive is having another good promotional offer. 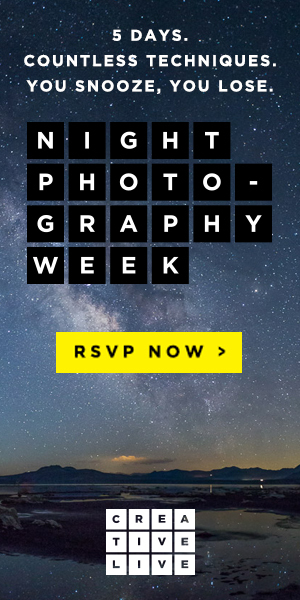 CreativeLive’s newest week-long event starts on Monday 9/12/2016 through Friday 9/16/2016. I’m an affiliate with CreativeLive and they’ve asked me to let you know that you will be able to view a free, yes, completely free, live broadcast of 5 On-Location courses for Night Photography Week. “On-Location” courses are the ones they teach and stream live from their San Francisco headquarters then later package and sell after the live event is over. What will be covered: You’ll learn all of the techniques needed for taking photographs at night (including tips and tricks on photographing star trails and the Milky Way, as well as night portraits and light painting). What’s different about this offering? : As far as I know, there isn’t anywhere else online right now where you’ll get what CreativeLive is offering next week, all in one place. If this sounds like something that is of interest to you then feel free to RSVP today! Note #2: After next week, the course will go back to its regular price of $245.